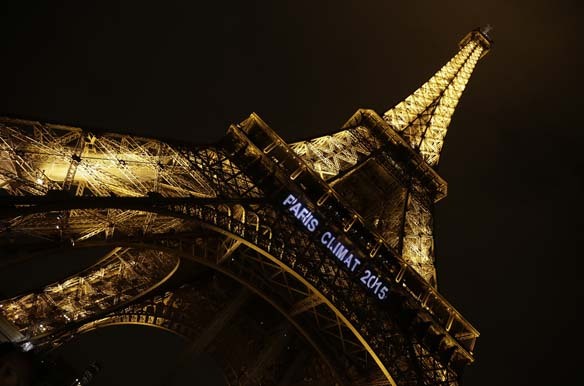 Lights on the Eiffel Tower read, “Paris Climat 2015” to mark the selection of the Paris to host the United Nations Framework Convention on Climate Change Conference of Parties in 2015 (Jacky Naegelen/ Courtesy Reuters). The Conference of Parties (COP 20) of the United Nations Framework Convention on Climate Change (UNFCCC) will convene a critical session in Lima December 1–12. It precedes COP 21, to be held in Paris in December 2015, at which a post-Kyoto global agreement (post 2020) on climate change must be finalized, in accordance with the Durban Platform for Enhanced Action. The outline of the Paris agreement is expected to begin to take shape in Lima. This agreement will determine the ambition and contours of the global response to climate change in the years ahead. The Ad Hoc Working Group on the Durban Platform for Enhanced Action (ADP) is mandated with reaching a global agreement by COP 21. Such an agreement would include a vast range of issues including mitigation, adaptation, finance, technology development and transfer, transparency of action, and support for capacity building. Since the ADP is under the convention, the contours of a new agreement will need to be in consonance with the principles of the UNFCCC, including Common but Differentiated Responsibilities and Respective Capabilities (CBDR/RC). While the principles are meant to guide efforts toward the ultimate objective of the Convention —to stabilize greenhouse gas concentrations—they have not necessarily been fully observed by Annex 1 countries, the countries that had committed to take the lead in these efforts, per Article 4 of the Convention. Alongside eliciting a renewed commitment from all parties to the mandate from Durban, the Lima meeting should also establish robust processes to consider scientific assessments andreviews (on climate change effects and responses) that are being developed or have recently been submitted to the convention, including the Fifth Assessment Report (AR5) of the Intergovernmental Panel on Climate Change (IPCC). The Lima meeting is also expected to lead to decisions on the contours, time lines, and anchoring in ADP, of the so-called Intended Nationally Determined Contributions (INDCs). There are at least four developments that may influence any global agreement on reducing greenhouse gas emissions. These include the domestic political challenges in the United States, the evolving global energy scenario, the European impulse to reindustrialize and regain competitiveness, and the dynamic and evolving role of emerging powers. Today there are 192 parties to the Kyoto Protocol, yet the world’s second largest emitter, the United States, has failed to ratify the protocol. It has, however, in a submission to the UNFCCC stated that it “supports a Paris agreement that reflects the seriousness and magnitude of what science demands.” Earlier in the year, the U.S. Environmental Protection Agency unveiled ambitious regulations on emissions mitigation for new and existing power plants as part of President Barack Obama’s Climate Action Plan. While a global agreement without U.S. participation cannot be considered a success, Republican leaders including Senator Mitch McConnell—who is likely to become Senate Majority Leader in the new Congress in January 2015—have publicly criticized the Obama administration’s climate change policies. The U.S. submission on the elements of a 2015 agreement outlines clearly that the country expects certain elements of the Paris agreement to be internationally legally binding. Yet the possibility of the U.S. Congress agreeing to commitments that fulfil the ambitious policy response envisioned in the AR5 remains bleak. The United States is the world’s largest oil consumer, and oil prices are at multi-year lows. For the first time since January 1994, the United States imported less than three million barrels of crude oil from the members of the Organization for Petroleum Exporting Countries (OPEC) in February 2013. In addition to the shale gas revolution that has inevitably led to an impulse to industrialize in the United States, there is weak demand from China and the EU that has added to the downward pressure on the price of oil. OPEC members are split on establishing a floor price for oil in this scenario, and high energy prices cannot be expected to act as a trigger for industrialized countries to invest heavily in alternative energies. Adding to the energy sector realities is the fact that the European Commission has explicitlystated that industry will be brought back to the core of European policies. In the midst of burgeoning unemployment, particularly among the youth, the EU agenda is set on bringing industry’s weight to 20 percent of GDP by 2020, from around 16 percent today. To fulfil this agenda, EU member countries are already consuming more hydrocarbons. (the Transatlantic Trade and Investment Partnership) that could give further impetus to reindustrialization. In the midst of these fundamental structural shifts, it is unlikely that EU leaders will commit to aggressive and bold climate change measures required of developed countries. The rise of rapidly growing developing countries and their different development trajectories will also complicate a global agreement. These countries, including China and India, which together account for nearly three billion people, face domestic imperatives to develop further, albeit of different dimensions and scale. India for one has to provide energy to 300 million of its people that have no access and millions more who have only notional access. It also has to provide jobs to nearly twelve million people who enter the workforce every year; a large share of those jobs will need to be generated by the manufacturing sector. This means that India will continue to negotiate for space and time to ensure its broad-based economic development and would ideally like to have the support of Brazil, South Africa, India, and China on this. It remains to be seen how the recent bilateral agreement between the United States and China could impact the group dynamics and whether this club of countries will continue to weigh in on the climate debate together in the run-up to the Lima and Paris meetings. The COP 20 at Lima will be an exercise in creating trust and credibility mechanisms under the convention. To avoid replicating mistakes from COP 15 at Copenhagen—where negotiations on the draft text fell through in the final hours—the discussions at Lima should be aimed at producing the draft negotiating text for the COP 21. This will enable a transparent and goal oriented process, which will be able to meet many of the expectations and constraints outlined above, at least in the short term. Improvement of energy consumption efficiency per unit of revenue earned (energy intensity) of large, energy-intensive corporations operating in industrial and energy sectors across the globe. Industry and energy sectors account for 45 percent of global emissions. Even relatively nominal gains in these sectors through policy incentives for enhanced energy intensity performance can yield large emission mitigation gains. Only corporations that are over a certain predetermined revenue, profitability, or turnover threshold, across the globe, should be considered within an incentives framework to ensure that actions are commensurate with respective capabilities. Realization of end-use efficiency through demand-side management. For instance, India’s Bureau of Energy Efficiency estimates that up to 50 percent efficiency gains (relative to current levels) can be realized through such processes domestically in case of commercial buildings alone. Given that the buildings sector accounts for around 8 percent of global emissions, there is significant scope for purposeful collaboration between developed and developing countries in demand side management. If it is understood that the principles enshrined in the UNFCCC should act a barometer for success, the conception of these principles must not be limited to procedural matters. An example would be the equitable transfer of financial and capacity building assistance from first-tier cities toward towns and rural areas within and across national geographies. Initiatives such as the C40 Cities Climate Leadership Group show that multi-stakeholder responses can be leveraged toward an ambitious climate change response and private sector stakeholders are ready to participate. Such initiatives both between countries and within countries would act as a robust means toward achieving sustainability. In Lima and Paris, the global community must ensure that obsession with the legal nature of the post-Kyoto agreement does not detract from achieving what is eminently possible. The next year will in any case determine whether or not climate multilateralism will work.